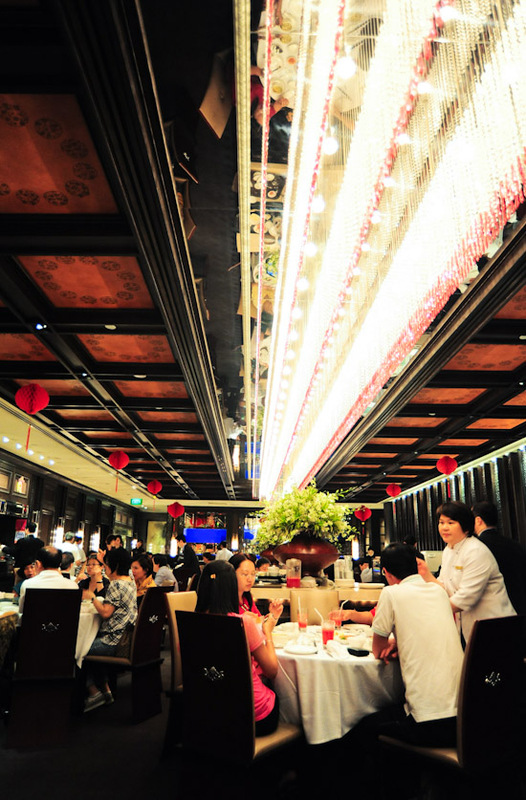 Amongst the Crystal Jade Fine Dining restaurants, there are Crystal Jade Golden Palace at Paragon (contemporary Cantonese & Teochew cuisine), Crystal Jade Dining In at Vivocity (modern Cantonese cuisine) and the flagship Crystal Jade Palace at Ngee Ann City. There are 35 items on Crystal Jade Palace’s dim sum menu, with the usual suspects like rice roll cheong fun, deep-fried shrimp dumpling, baked egg tart, siew mai, har gau, and steamed pork ribs. The prices are very reasonable for a Chinese fine dining restaurant, with most of the dim sum ranging from $3.60 to $5 per basket. 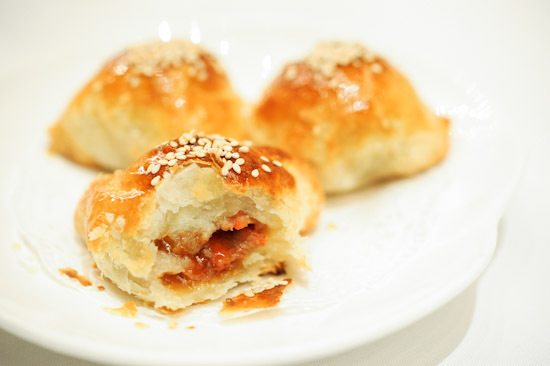 The Char Siew Sou ($4) had buttery and flaky pastry, and I love the sweet yet savoury char siew fillings. I’d think that Crystal Jade Palace’s char siew sou is on par with the ones that I’ve had at Taste Paradise and Yanting restaurant. There were so many different types of steamed dumplings on the dim sum menu and we were spoilt for choices. Since it was our first time to Crystal Jade Palace, we took the safe option and went for the ubiquitous Steamed Prawn Dumplings ($5). It was fairly decent, the translucent skin was not too thick, and came with fresh crunchy shrimp. Similarly, the Steamed Pork Dumplings with mushroom ($4.8) were not out-of-this-world good, but they were tasty and that was enough. And what’s dim sum lunch without Steamed Rice Roll cheong fun ($4.8)? We easily finished it and only decided against ordering another portion as we had other dim sum coming. When broken with a pair of chopsticks, the Xiaolongbao ($3.9) released the tasty stock into the spoon. Paired with vinegar and ginger, it was satisfying to swallow the whole pork dumpling. My friend was feeling a little health conscious that day so we went for the Steamed Carrot Cake instead of the pan-fried one. It would not win a food photography competition, but the steamed carrot cake definitely tastes good. With the fairly good dim sum at reasonable prices and its convenient location at Orchard road, Crystal Jade Palace has joined my ranks of my favourite dim sum restaurants in Singapore. If you don’t feel like having dim sum, there’s always Crystal Jade Korean Restaurant as well as the more affordable Crystal Jade La Mian Xiao Long Bao at level four of Takashimaya. The fine dining restaurant was packed when we went there on a weekend, reservations are highly recommended. Hello. You finally went to my all time fave dim sum place ! I’m glad that you enjoyed the food there. I love their dim sum so much. When I was studying overseas and came bk to Singapore for hols, I would always make it a point to have their dim sum. Thanks for a review on one of my fave yum cha places. It’s weird to see fine dining restaurants in Singapore allowing the casual dress code. can someone email me the Chineses New Year menu for next year please? I am keen with Crystal Jade at the Paragon. Thanks. I just ate dinner last week at Crystal Jade Palace at Ngee Ann City. I went there a few times in the past. It’s a nice place and delicious foods. But I happened to order shrimps with salted egg. In 1 plate, I found 2 shrimps when I cut it, at the head part came out quite a lots of brown liquid. When I asked about it to the staff, they called a woman maybe the manager then she started to say that it’s a common things when you ate shrimps and that’s why people don’t cut the head part cause it’s have high cholesterol and bla bla bla. I ate a lots of shrimps in my whole life but never find such brown liquid in my shrimps. Really disappointed. Finally I just throw it away and leave the restaurant without saying further..